Easy to use and inexpensive temperature probe. Features a plastic probe, a high-level linear output of 10 mV per degree K, a typical accuracy of ±1°C (±1.8°F) at room temperature, and a range of -40 to +100 °C (-40 to +212 °F). 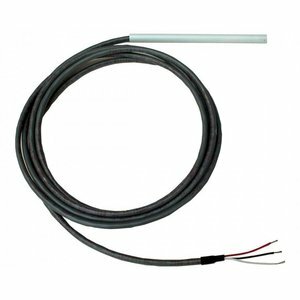 The EI-1022 is a universal temperature probe that consists of a National Semiconductor temperature sensor mounted in a plastic tube with a current limiting resistor. This probe when connected to 5 volts DC will output a nominal 3.0 volts at room temperature. The probe is suitable for air and surface applications. 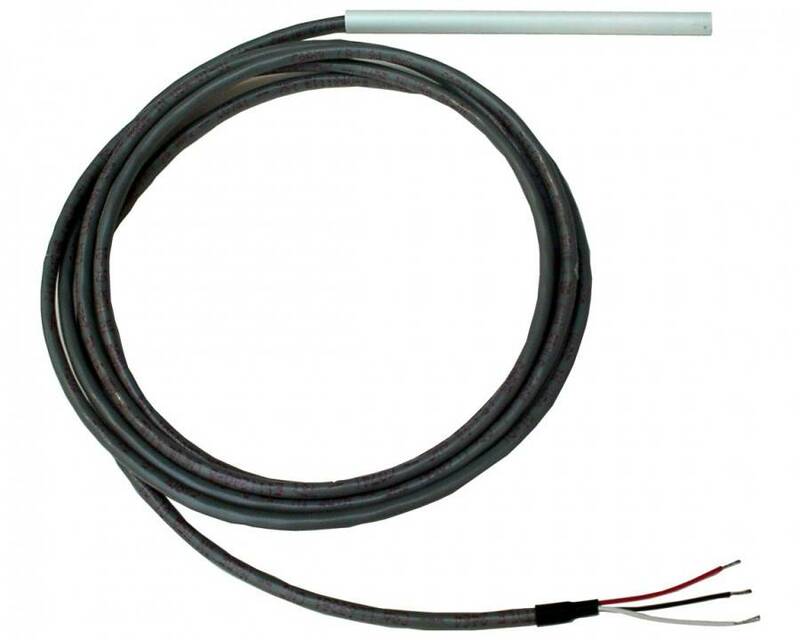 The EI-1022 is intended to be connected to a LabJack for 5 volt power but can be used as a stand alone temperature sensor when connected to a DVM and a 5 volt source. Multiple probes can be connected to a single LabJack, up to the number of analog inputs available on the device. Three wires require connections; they are +5 volts (red), ground (black) and output (white). These wires can be connected to the appropriate terminals on a LabJack or other power supply in the case of using the sensor as a stand-alone unit. The output wire will normally output a voltage of approximately 3 volts at room temperature. Once the temperature probe is connected to an AI channel on a U12, it may be desirable to use the LJlogger program to display temperature in degrees F or C. In order to make the LJlogger readout in degrees C, simply enter 100 for the multiplier and –273.15 for the offset in the appropriate row corresponding to the temperature sensor. In order to make the LJlogger readout in degrees F, enter 180 for the multiplier and –459.67 for the offset. The temperature will appear in the “scaled data” column. When using the probe with the U3 the following should be considered. The probe outputs 10 mV per degree K. That means that at room temperature, the probe outputs about 3 volts. The high-voltage channels on the U3-HV can certainly handle this, but the normal single-ended range of the low-voltage channels on the -HV and -LV is about 0-2.44 volts. The solution is simply to use the "Special 0-3.6" volt range. To get this range, use a differential channel where the negative channel is set to the special internal value of 32. In DAQFactory Express, put 32 in the QuickNote/Special/OPC column for a particular channel. Although the temperature sensor and associated electronics are rated for 100 degrees C, the cable is only rated for 80 degrees C. We have tested the cable, probe at 150 degrees C, and have noticed the cable gets soft at the high temperatures but continues to function. When the cable and probe were returned to normal temperatures, no degrading was observed in the cable or probe. Also at the low temperatures, the cable is only rated to -20 degrees C where the sensor and associated electronics are rated lower. Testing the probe with the wire at the lower temperatures showed normal operation and no degrading of the cable when returned to normal temperatures. The user should be aware that even though the probe itself can operate at the rated temperatures the use of the cable in environments of over 80 degrees C and lower than 20 degrees C is at your own risk.